The prosecution rested its case Thursday in the corruption trial of former Virginia Gov. Bob McDonnell and his wife, Maureen -- but not before revealing the grand total in gifts, trips and loans they say the couple accepted from an ex-CEO: $177,044.06. Jurors had seen the pictures of the many gifts Jonnie Williams gave the McDonnell family. Thursday, they got to see the real thing. From his position in the witness stand, FBI special agent David Hulser identified and held up the $19,000 worth of designer dresses, shoes and a purse that Williams bought for Maureen McDonnell in an April 2011 shopping spree in Manhattan. The golf bags and clubs were toted across the courtroom, and the Rolex watch purchased by Williams for Maureen to give to the governor made another appearance. The McDonnells returned all the gifts when the investigation became public. But the aim of Thursday's display was clear. The accounting of the shopping spree is just one of dozens of elaborate charts the prosecution showed the jury to tie together the evidence, much of it in emails and texts. Other charts show the McDonnells deep credit card debt, which at one point reached $90,000. 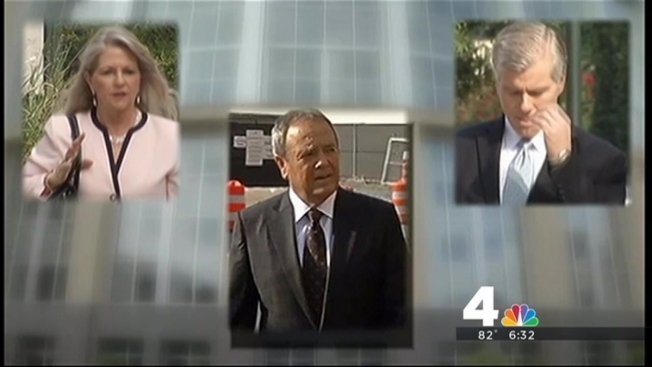 Prosecutors suggest financial troubles motivated the McDonnells to accept help from Williams. The McDonnells are charged in a 14-count indictment with accepting tens of thousands of dollars in gifts and loans from Williams. Prosecutors allege in that return, the couple promoted William's company, Star Scientific Inc., and its dietary supplement Anatabloc. In addition to spotlighting the couple's credit card debt, another chart shows red ink for the real estate company McDonnell ran with his sister -- $70,000 in loans were written to that account. Hulser walked the jury through all interactions between the McDonnells and Williams, via texts, emails, phone records, calendar entries, photos and testimony. For instance, on Feb. 29, 2012 -- the day of the reception for health care leaders at the executive mansion that's received so much attention -- the chart shows a meeting on the governor's calendar with Williams that morning. Just a day earlier, the chart notes a call between the governor and his stockbroker. The broker had testified that Bob McDonnell had inquired about a possible stock transfer and how it might be recorded. The chart shows that shortly after McDonnell's meeting with Willians on Feb. 29, Williams called the McDonnells' stock broker at 3:30 p.m. Then, from 5:30 to 7 p.m., the McDonnells attended the now-controversial health care leaders reception. Trial testimony revealed the McDonnells added 25 guests that had been selected by Jonnie Williams to the invitation list. The next chart presented shows a series of texts between Maureen McDonnell and Bob McDonnell's sister, informing her a $50,000 check to Mobo Realty would be arriving via overnight delivery. Testimony showed the idea of a stock transfer was abandoned in favor of a check to Mobo Realty, the real estate company Bob McDonnell operated with his sister. But defense attorneys fired back in cross examination. They pointed out the flashy charts seemed biased -- and left out important information that could tell a much different story. Bob McDonnell's attorney wondered why why a chart of credit scores wasn't included, and asked: "And those credit scores were excellent at all times?" "I believe so," said Hulser. Now that the prosecution has rested, the jury will have a day off Friday, and will begin hearing from defense witnesses Monday. On Wednesday, William Sessoms, the mayor of Virginia Beach, and a loan official testified that the McDonnells failed to disclose loans and debt on financial applications. Sessoms, who is also the president of TowneBank's parent company, testified that Bob McDonnell failed to disclose loans taken from Star Scientific CEO Jonnie Williams on an application to refinance a TowneBank loan. It was also revealed that three days after the McDonnells learned they were under investigation for corruption, Bob McDonnell filed a revised loan application form that did include details of the stock and the loans. Hulser, the FBI agent, was the day's final witness. He showed the jury the extensive color-coded chart that outlined all of the records, phone calls and documents investigators had collected. The evidence showed the couple had a lot of credit card debt: about $74,000 in January 2010 when the governor was sworn in; it had grown to more than $90,000 by September of that year, and dropped to about $31,000 by April 2011. Prosecutors allege financial distress was one of the reasons the couple accepted gifts from Williams.